Lew & Huey Phantom A Khaki and Phantom A Black with date. There is actually more to the brand’s story than it is shown on Wikipedia. Back in 2012, Chris Vail was working in sales and on a Monday, his boss told him that his services are not required any more. Without a job he started thinking about creating an e-commerce website, but he was not quite sure in what field. Usually, bad things don’t come alone, on the Wednesday of the same week, his quartz chronograph that he bought about a year earlier stopped working. Frustrated with batteries, he wanted to replace it with an automatic chronograph, but he was surprised to discover their price. This gave him the idea to create his own watch brand of original, attractive and affordable timepieces that he could sell online. In a typical entrepreneurial spirit, he turned two unfortunate events into a positive outcome, and the huge success of his debut model, the Ricardo chronograph, encouraged him to continue on this path. While I knew Lew & Huey from the Internet, I never had the chance to actually handle one, and when Chris offered me to take his latest model, the Phantom for a test-drive, or since we’re talking about a pilot watch, for a test-flight, I jumped on the occasion without hesitating. The inspiration for Phantom collection comes from aviation, with design elements borrowed from cockpit clocks. There are actually six models in the Phantom collection: the Phantom A Black has a black dial with numerals at 3, 6, 9 and 12, the Phantom A Khaki with the same layout but with a beige dial, and finally, the Phantom B Black with a black dial and indexes instead of numerals. 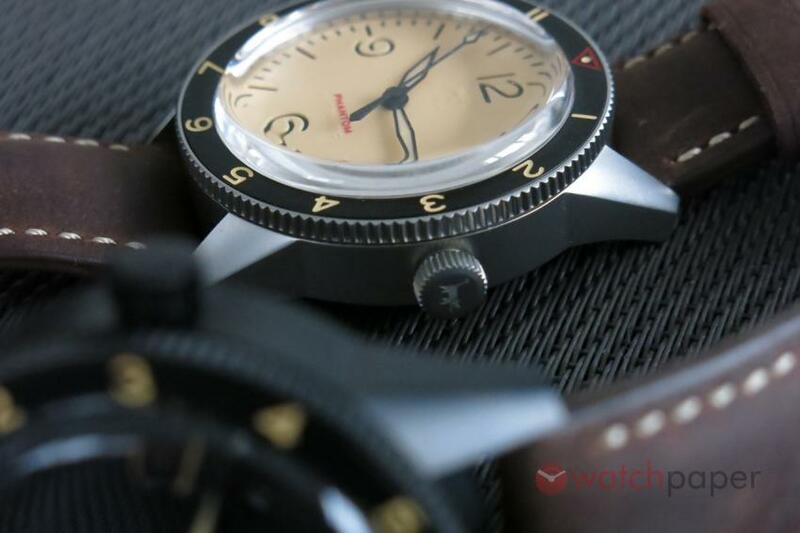 All three models have a date and a no date version, as well as the possibility to choose between brushed stainless steel or black DLC coating for the case. 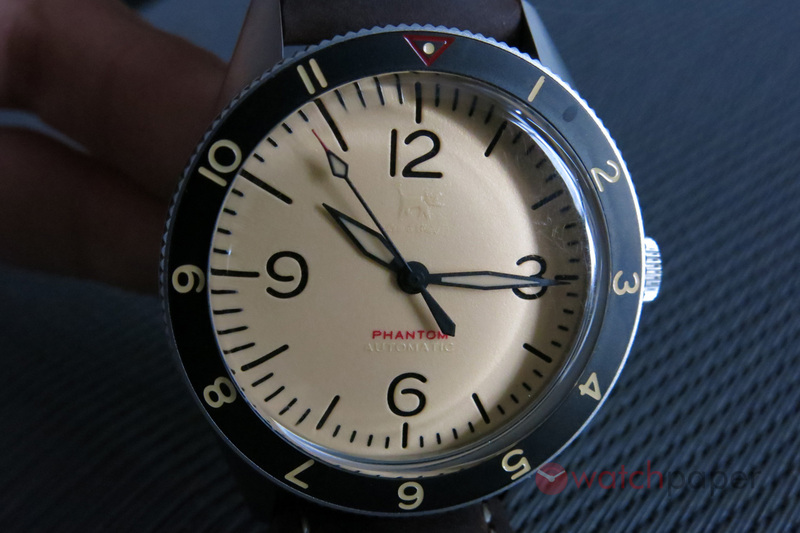 In this review, we will go through the Phantom A Black with date and DLC coating, and the no date Phantom A Khaki. When I first saw the Phantom collection, I could not help but think of the Bell & Ross BR123, but the more I learned about these watches, the more I realized that beyond the similarities, there are plenty of differences that make the Phantom a watch with a lot to offer. The 3 mm thick domed acrylic crystal adds to the depth of the Paneraiesque sandwich dial. I found it especially spectacular on the black dial version, the bottom khaki layer is revealed more or less depending on the angle of the light and the shadow of the top black layer. Add to this the distortion created by the domed crystal and you end up with a dial that won’t get you bored. Reading the time is really easy thanks to the bold hands, both dial set-ups work great: on the black dial, the hands stand out because of their luminous coating, while, on the khaki dial, it is their black contour that sets them apart. In dark, things get even more interesting. The khaki dial is fully coated with luminous paint, it looks sensational! The Phantom Black, as I mentioned, has lume on the bottom layer of the dial, with all the indexes and numerals lighting up in the dark. 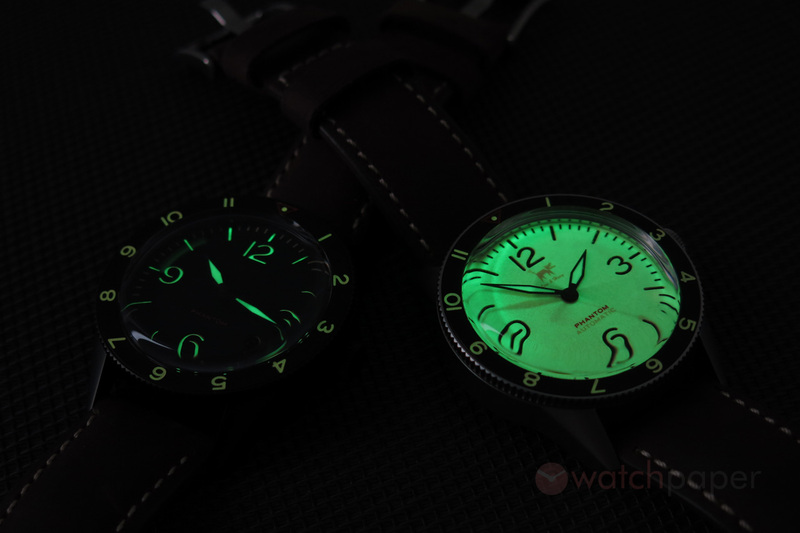 On both modes, the markers on the rotating bezel are also filled with lume. Seen from the side, I find it interesting the contrast between the rounded crystal and the flat bezel. 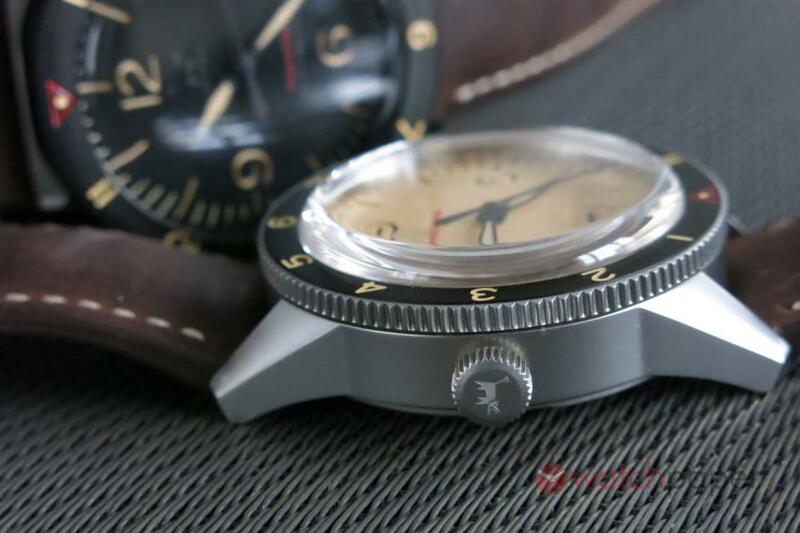 The bezel, in typical aviation style, is bidirectional, its reeded edges offering a good grip for turning it. 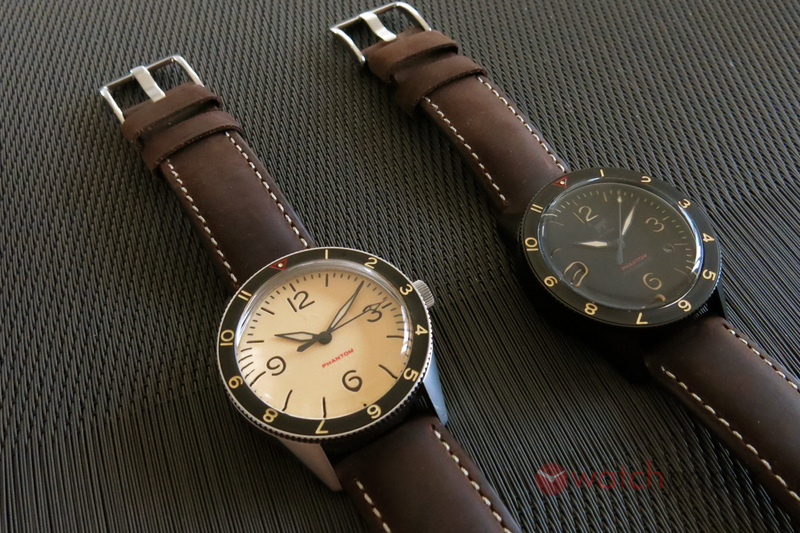 On both watches, the bezel was turning smoothly, but firmly, none of them was too tight or too loose. The case itself has a diameter of 42 mm, with a length of 50 mm. 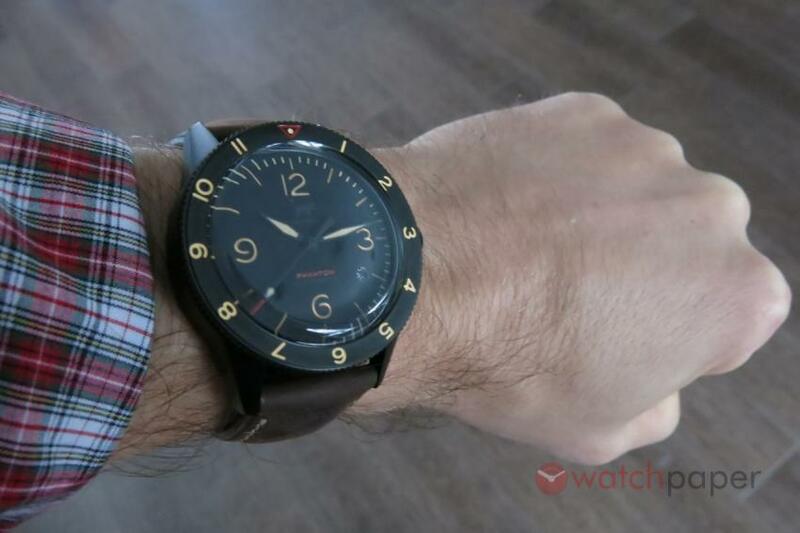 I have small wrists, for me, it’s usually 42 mm the limit, 40 mm being my preferred size. With the Phantom, I never felt that I’m reaching a limit, even as I’m writing this review, it feels so comfortable that I could sleep with it. The crown, which is decorated with the Lew & Huey dog, is really smooth to operate. It is the right size, not too big to hurt, but it’s big enough so that you can easily wind the watch or adjust the time. 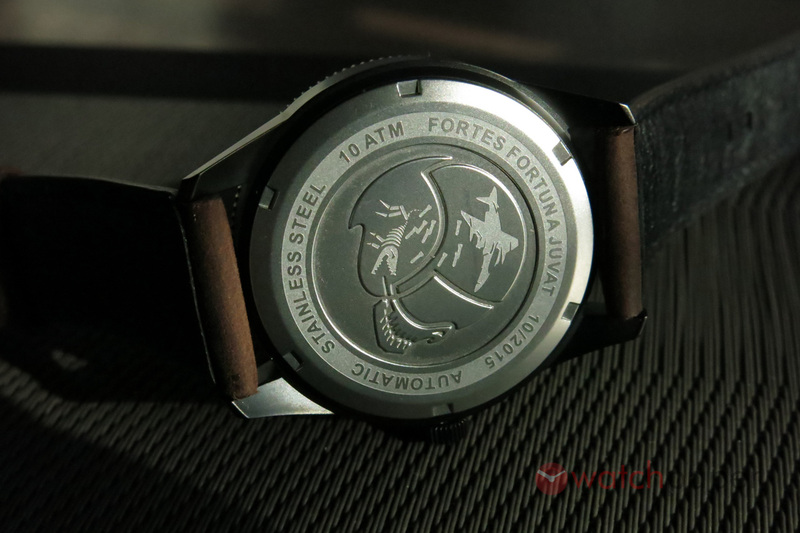 The back reveals a completely badass side of the watch. It is decorated with a skull wearing a pilot helmet, which features an F4 dropping bombs on the skeleton of a dog. 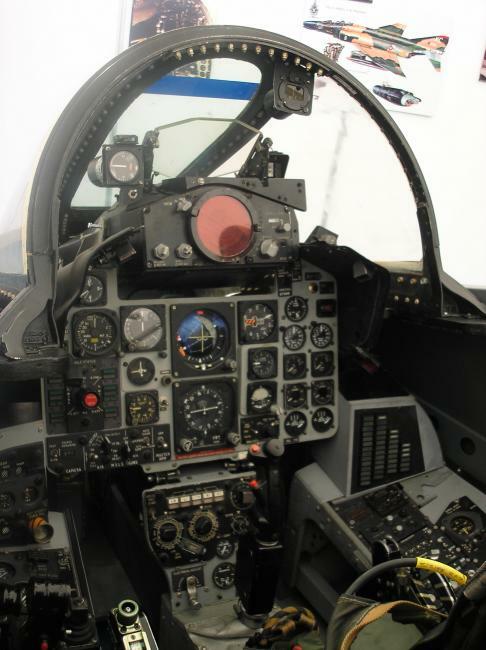 The F4 bomber is actually the where the name of the watch comes from, the McDonnell Douglas F-4 Phantom II fighter-bomber. Around the helmet, we can read a Latin motto, “Fortes Fortuna Juvat” — Fortune favours the brave. I find the design of the watch to reflect nicely the Phantom spirit, for example, the dog logo on the dial at 12 o’clock is hardly visible, it’s almost like a phantom. Just as the inscription, “Automatic”, at 6 o’clock, that can only be perceived at a certain angle. This makes the dial cleaner, letting the all the attention to be focused on reading the time. Not a huge thing, it’s just the fussy graphic designer in me looking to complain about something, but I would have loved Lew & Huey to use the same font for the numerals as the one used in the Phantom cockpit. Here is a picture, I borrowed from Wikipedia, of an F-4 Phantom II cockpit, you will notice that the number 3 is different. Lew & Huey Phantom A Black with date. Between the date, or no date, I prefer the one without the date window. I don’t know how it would work with the beige dial, but on the black dial, the white numbers on the black disk are small and are hardly visible. The circle shaped window is really narrow, and when you get to double digit, things are a bit tight. If the date is not important for you, go with the plain three-hands watch; even setting the time will be easier, as you don’t have to fiddle with adjusting the date. Under the hood, there is a Seiko NH35 (4R36) automatic calibre, beating at 21,600 vph, offering a power reserve of 41 hours. It’s a workhorse that you find in many Seiko watches, doing its job reasonably well. The watch is shipped with a 22 mm brown European leather strap that nicely reinforces the vintage aviation theme of the watch. Lew & Huey made its name for being a brand with original designs. By opting for a design inspired by several iconic watches, the Phantom collection brakes this tradition. 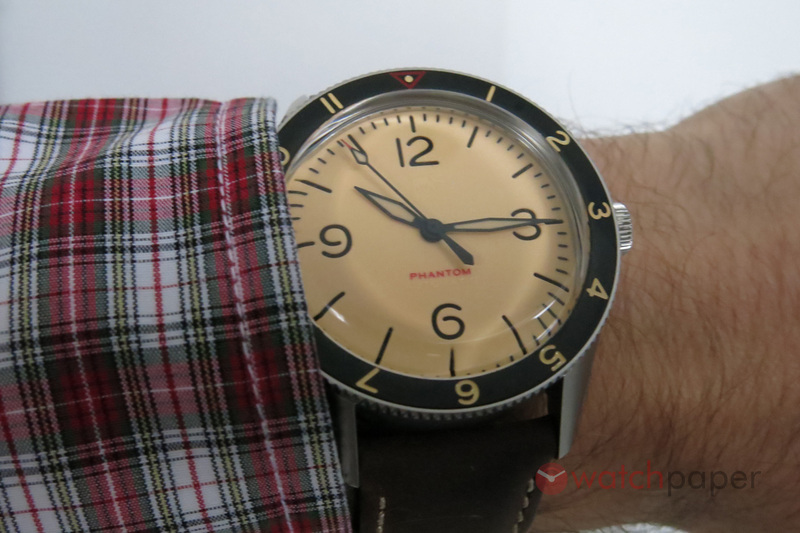 It is way too different to be called an homage watch, there are too many little details that can be traced to other tool watches, but they come together to create a completely new tool watch, the Phantom. How does it feel wearing a Phantom? 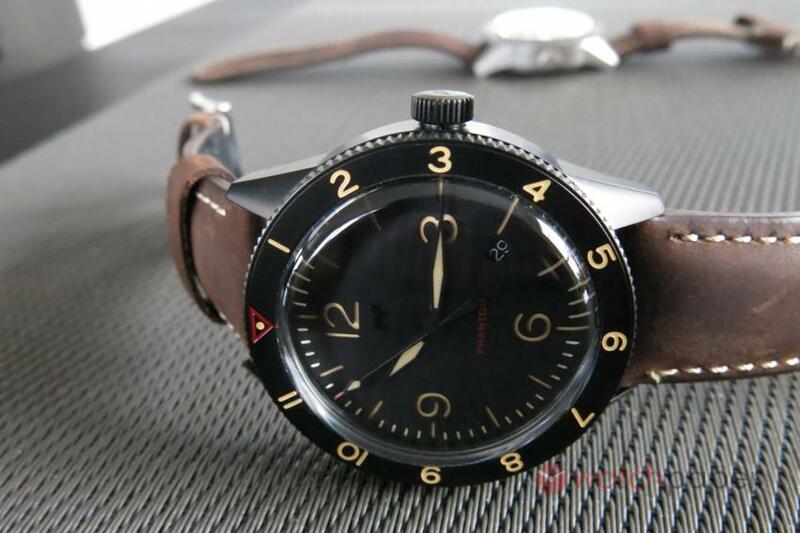 It is so comfortable, and I often forget that I’m wearing it, but when I do remember, the oil tanned leather strap, the layout of the sandwich dial, that thick acrylic crystal, the rotating bezel, they are all inviting me to adventure at Mach 2.2. 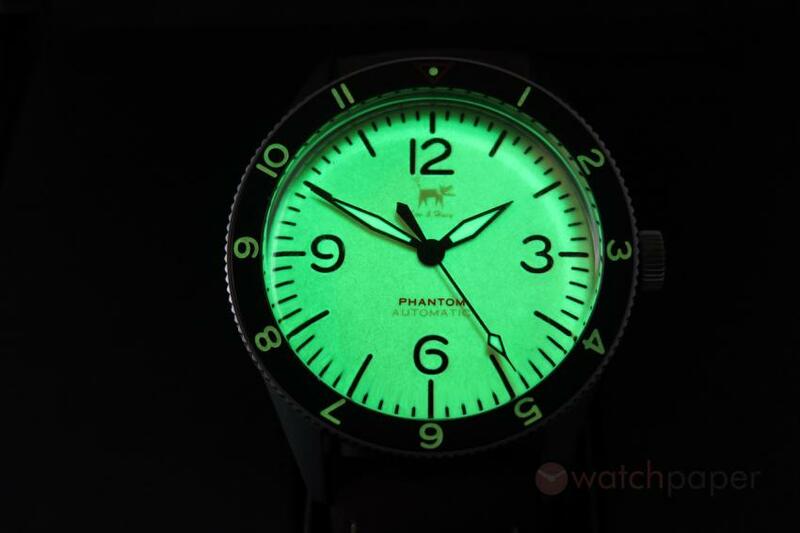 As I’m writing this review, on www.janistrading.com, the e-commerce website of Lew & Huey, the Phantom goes from $633 CAD for the black dial version to $655 CAD for the full lume dial. If you chose the DLC version, add an extra $25. They are covered by a two years warranty. Wristshot with the Lew & Huey Phantom A Black with date. The full lume dial of the Lew & Huey Phantom A Khaki. 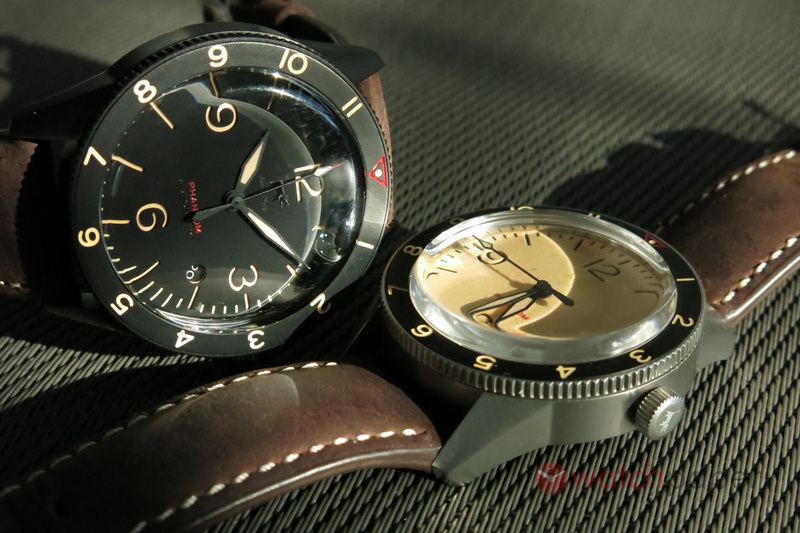 A group photo in darkness with the Lew & Huey Phantom A Khaki and Phantom A Black with date. For more pictures, take a look at our dedicated Facebook photo album.